Sciences Po has launched its newsroom, an online space for journalists and members of the public who would like to keep up with the university’s news. This new platform is available in French and English and provides centralised access to all the information about Sciences Po that may interest the media. News articles, press releases, press kits, photos, videos, graphics, the events calendar and the research directory are now available on a single platform. With this new space, journalists have quick, easy access to centralised resources that can be searched by keyword and by date. The “Headlines” section gives an overview of Sciences Po's latest news, activity on social networks and upcoming events. The alphabetical research directory and the topic index are also available on the homepage so that journalists can quickly identify a researcher or a research topic currently being explored at Sciences Po. The “Media Kit” section includes videos, images (logos and visual identity, illustrations of Sciences Po in Paris and of our six regional campuses) and a media library of resources providing key information on teaching programmes, annual admissions reports, graduate employability surveys, etc. The logos and items in the photo gallery can be downloaded after completing the online request form. The “Sciences Po in the News” section brings together articles in the French and international press and is updated daily. This new platform reflects Sciences Po's desire to facilitate access to university and research news for the French and international media. 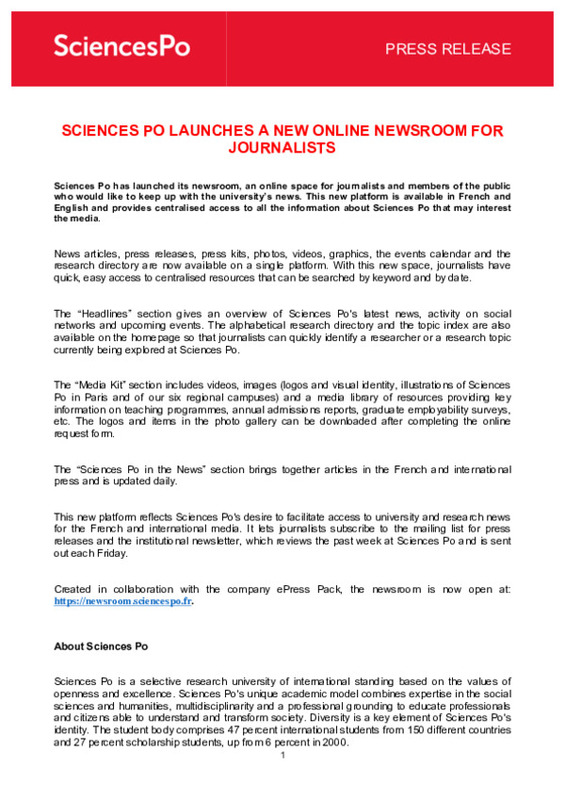 It lets journalists subscribe to the mailing list for press releases and the institutional newsletter, which reviews the past week at Sciences Po and is sent out each Friday. Created in collaboration with the company ePress Pack, the newsroom is now open at: https://newsroom.sciencespo.fr. Sciences Po is a selective research university of international standing based on the values of openness and excellence. Sciences Po's unique academic model combines expertise in the social sciences and humanities, multidisciplinarity and a professional grounding to educate professionals and citizens able to understand and transform society. Diversity is a key element of Sciences Po's identity. The student body comprises 47 percent international students from 150 different countries and 27 percent scholarship students, up from 6 percent in 2000. Sciences Po inaugure son nouveau campus de PoitiersInauguration du nouveau campus de Sciences Po à PoitiersSciences Po et l’Université de Strathmore ouvrent un nouveau double diplôme Sept grandes universités française, allemande, hongroise, italienne, roumaine et suédoise s’unissent pour créer CIVICA – l’Université Européenne des Sciences SocialesClassement QS : Sciences Po 3ème université mondiale en "science politique et relations internationales"